Mark Cullen is Canada’s best known gardener connecting with over two million Canadians weekly through his many varied media outlets. Whether it is through his weekly CTV morning show segment, his many on-line postings or his numerous books, his personable style and topical information has captivated audiences and continued to garner him fans across Canada. As a spokesperson and horticultural consultant to Home Hardware, Mark has spent years speaking to everyday Canadians about their gardens and has synthesized his experiences into his latest comprehensive and easy to understand publication. 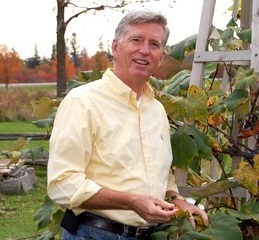 Cullen not only helps everyday Canadians grow organic, healthy produce but, due to his well-known sense of social responsibility, actively participates in local, provincial and international developmental and educational programs. As the volunteer spokesperson for SHARE Agricultural Foundation, Mark helps farmers in developing countries obtain “A Hand Up not a Hand Out”. Mark lives in his environmentally friendly dream home where he enjoys his 10 acre garden and spending time with his wife and four children. Mark is the founding Chair of Trees For Life, the Urban Tree Canopy Coalition. This not for profit organization is dedicated to doubling the tree canopy in urban spaces across Canada. Radio: You can catch ‘The Green File’ on Canada’s largest AM radio station 680 News in Toronto, 570 News, Kitchener, 1310 News, Ottawa, 660 News Calgary, 1130 News Vancouver and CJAD Montreal. Television: He is the co-host of Canada AM’s weekly Gardening segment with Jeff Hutcheson, dispensing gardening advice and laughs on Friday mornings at 8:40am. (www.ctv.ca/canadaam). Syndicated newspaper column: Mark’s weekly garden/environment column appears in more than 25 newspapers in 6 provinces. Magazine: Mark writes regularly for the Harrowsmith Canadian Almanac, Harrowsmith Gardening Digest, Active Magazine and Reno and Décor Magazine. Mark is also feature garden writer for Home at Home magazine which boasts a circulation of 400,000. www.homeathome.homehardware.ca. Print: Mark Cullen is a bestselling author with over 500,000 books in print in Canada. His latest (and 19th) book “Extra Ordinary. The Hugh Beaty Story” was self-published as a fundraiser for SHARE Agriculture Foundation. Web: Mark has the most comprehensive Canadian gardening information website. Built to include an internal search engine, www.markcullen.com answers up to 10,000 gardening questions. He offers visitors a free monthly E-newsletter, now with subscriptions over 20,000. Listen to ‘The Garden Show’ podcast each week and read about current ‘things to do in the garden checklist’ and great gardening advice in Mark’s weekly blog. Spokesperson: Mark is president of Mark’s Choice Ltd., a horticultural communications and marketing company. He is also the spokesperson and horticultural consultant to Home Hardware Canada, PremierTech Home and Garden: Golfgreen fertilizers and lawn seed and Green Earth Garden Products. Community: Mark is volunteer spokesperson for SHARE Agricultural Foundation www.shareagfoundation.org, Canada Blooms Flower and Garden Festival www.canadablooms.com and the Composting Council of Canada www.compost.org. In July 2003, Mark earned the ‘Queens Jubilee’ medal for his “outstanding contribution to helping to feed the hungry through his work with Plant A Row Grow a Row” with whom he continues to be associated.